Cremona was alive with violin making at the end of the 18th century as the late Cremonese school developed from the 1770s onwards. From the twilight of the Cremonese golden period, Carlo Bergonzi’s son and grandsons had continued making violins, bridging the gap between the classical Cremonese tradition and this new revival. Then Carlo Bergonzi II and his brother Nicolò were joined by G.B. Ceruti, Lorenzo Storioni and Giovanni Rota as violin making flourished in Cremona once again. At first glance, Cremonese violin making in this period was highly personalized. While constantly referential to Cremona’s past, each maker found a way of expressing an individual approach to the craft, providing definitive examples that clearly set each craftsman apart. However, on closer inspection the subject becomes complex and full of narrative. Far from conforming to the idealized romantic notion of the violin maker as the artist, these were fast-working, highly professional, practical and capricious makers. Their experienced eye for quality was finely balanced with the economic reality of the times. Collaboration was commonplace, and these makers seem to have trusted each other’s judgement. Instead of leaving the master maker to do the finishing work, each craftsman left his imprint on the parts that he made. A collaboration between Lorenzo Storioni and Nicolò Bergonzi is hardly surprising considering that between 1790 and 1795 both makers lived with their families in the Casa Bolzesi on the Contrada Coltellai. 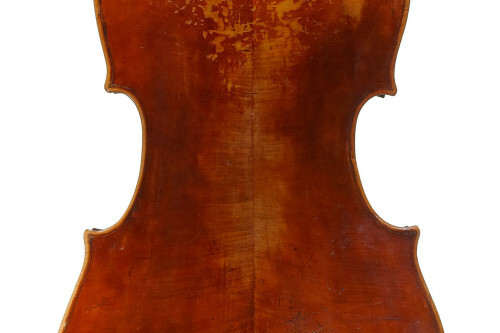 The crisp scroll of this cello is typical of Storioni’s hand. It has a characteristic extra turn before resolving into the eye and is squarish in appearance when viewed from the front and back. Likewise the soundholes have a symmetry between the upper and lower halves that is a recurring feature of his work. Yet Bergonzi’s hand dominates the model of the body. The box-like outline with very short corners and practically parallel C-bouts follows his interest in recalling the violins of his grandfather. Similarly the fullness of the arching is more characteristic of Bergonzi than Storioni, who was pursuing a flatter modeling inspired by ‘del Gesu’ by this point. The rich dark varnish that covers the instrument appears to be Storioni’s. 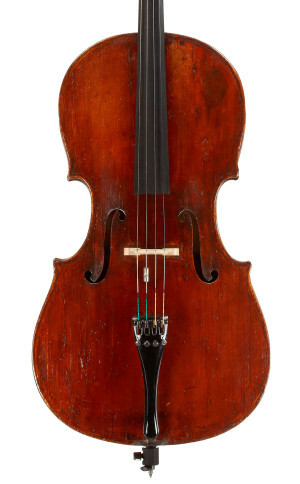 Cellos of the late Cremonese school are extraordinarily scarce. The few examples by Storioni show that his well-earned reputation for making violins translates directly into his approach to cellos. Those by Bergonzi are even rarer, with only a couple of other examples known. This instrument provides an important waypoint in understanding the work of Storioni and Bergonzi individually as well as shedding light on the complex relationships that existed between Cremonese makers of this period.